What should be the future priorities in researching ICT4D? The post-2015 development agenda will be the single most-important force shaping the future of international development. In planning our priorities for development informatics (DI) research – the academic study of ICT4D policy and practice – we should therefore pay close attention to the post-2015 agenda. In previous blog entries, I have discussed: the process by which the post-2015 agenda is being created; its importance; its content; and the way in which it reflects changing trends and priorities in international development. In this blog, I summarise the findings from a recent working paper: “Future Priorities for Development Informatics Research from the Post-2015 Development Agenda”. This presents results from a content analysis exercise which compared the content of the post-2015 development agenda against the content of 116 recently-published papers researching ICT4D. The basic comparison is shown in the figure below. 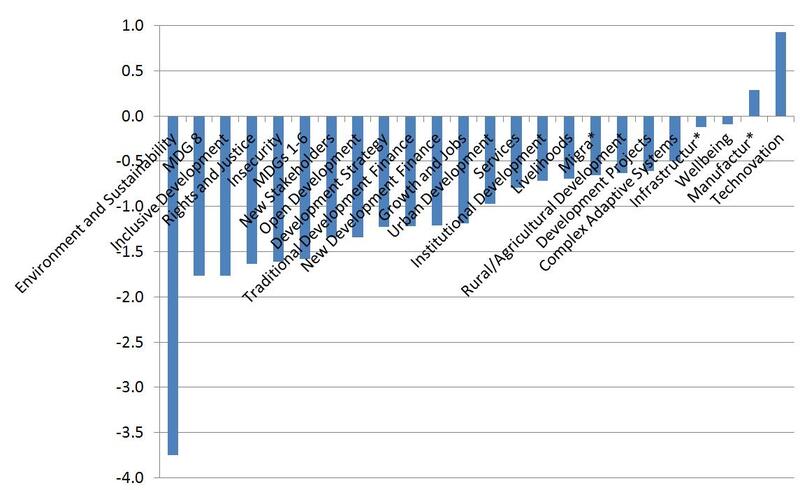 It provides a measure of research gap by plotting the extent of difference between the post-2015 text and the development informatics papers; aggregated into a set of development issues. Issues above the line are more highly represented in DI documents than in the post-2015 agenda; issues below the line are less highly represented. The larger the indicator the greater the over- or under-representation. This chart plus a whole set of other analytical data (see online paper for details) produce the development informatics research priority map shown below. Laterally, it sorts research issues in terms of their relation to development. Mainly by type of goals – environmental, economic, social, political, or cross-cutting – but also including mechanisms of development. Vertically, it sorts research issues in terms of gap. 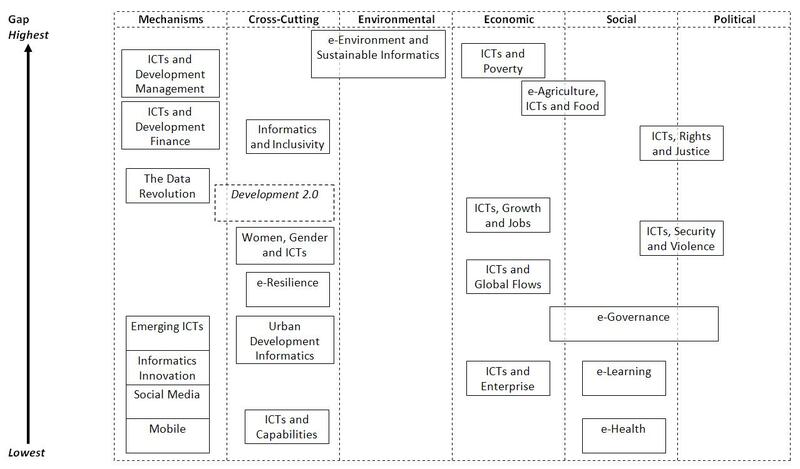 The higher up the diagram a topic appears, the greater the gap between its presence on the post-2015 agenda and its presence in current DI research. The larger the gap, the greater the need for additional development informatics research on this topic in future. Put another way – if you are planning what ICT4D-related topic to research in future, there is a logic in starting your search at the top of the figure. Further details about the topics identified in the research map can be found in the online paper.